It was Father’s Day. A sunny day. Wiseguy was excited to have the kids and grandkids over for this special day. I must admit that every year the children try to find ways to surprise their father with unique and unexpected gifts. Wiseguy is now at that point in his life where he lacks nothing, nor does he wish for anything. The creative gift ideas were becoming a challenge. One package he opened was not something either of us expected. It contained a garden gnome. True, none of those existed at our house. The second package contained another gnome. They were each about two feet tall. One was jovial and the other was quite stern and serious. Happy Gnome (on the left); Wise Gnome (on the right) – See??? Gnomenclature!! Cooler weather arrived. Fall was starting to shut down summer. We moved our tenants into a bench seat to hibernate for the winter. Better to keep them hidden instead of having to clean snow off them. Fall became winter, winter became a harsher winter, that part of winter finally turned into slushy spring. After all the snow melted and the torrential rains abated, we re-introduced our ceramic/clay garden-variety (haha) gnomes into the backyard. You recall them? Happy and Wise? The new year had begun and many new adventures for this fun pair! Or were there? It was the beginning of spring. As I had mentioned, the snow had melted, the rain continued to cover the earth, but we felt confident that our two friends could handle the elements. After all, they were garden gnomes. One foul evening, the wind gods swept through our city. They ripped shingles off houses. Garbage bins went flying down the street. You could actually hear the wind howling. It whistled through the tree branches in an almost taunting way. We hoped for the spring weather of yesteryear. Luckily the winds died down. The clouds had finally exhausted their waterlogged fluffiness. The sun arose with a special kind of brightness. The inclement weather ordeal was over. I decided to venture outside and tally up the damage to our garden. Sadly, my first steps through the rear door revealed devastation that I had not expected. I opened the screen door and put hands to lips to stifle the scream of despair I felt clawing to escape from my mouth. There, on the interlock brick, were pieces; many coloured pieces. Blue, green, black, grey, red. There had been a fatality! I looked to my right and saw Happy. The wind had turned him slightly sideways. His eternally smiling face was there and his hand was still pointing as it usually did. However, this was something surreal. His hand was pointing at the remains of Wise gnome. There he was, atop the bench seat, slightly askew from the night before. His companion…the seriously, stodgy, Wise gnome was gone…in pieces…never to be repaired. No Humpty Dumpty future for this gnome. Comedic value? Hands down, high five, fist bump…absolutely 100% classic hilarity! Do I miss our elderly Wise gnome. Meh…he lived…but not really. Seriously…check out Happy! Would you not want your life to be as happy as his everyday? I know I would! It does not mean that you have to be mean to other people; although he does appear to be a prankster. Those happy squint eyes and the smiling face…look at it! That’s the model trouble-maker image. Even with his disheveled clothing and half torn boots, he has found a way to make himself laugh. I guess that’s why I like him. No matter what adversity is thrown my way, I believe I can always find something to make me happy and appreciate all the good in my life. So, if you feel lost and lonely or if you feel like you are being bullied or if you feel like you will never win…think of Happy. Look at this picture and remind yourself…life is what you determine it to be. If I can be like Happy (bwahaha) I will have a happy day, everyday. P.S. 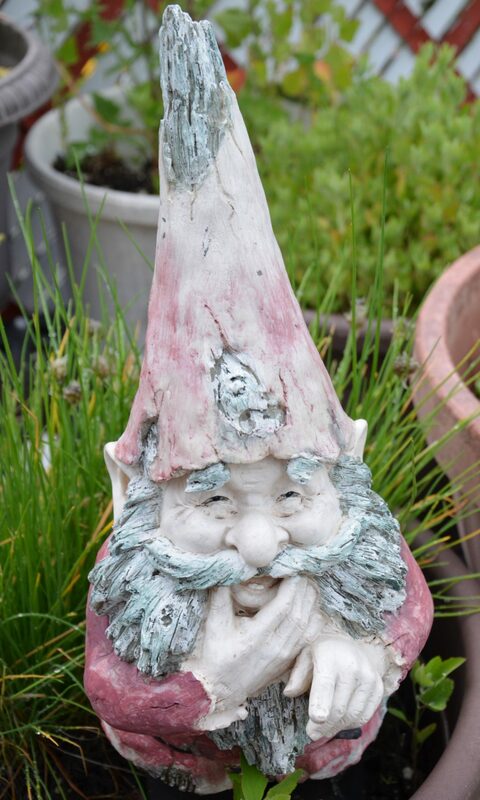 Gnomenclature states: the naming of garden gnomes based on their statuesque appearance. You can be whoever you want to be. Stand in front of that intimidating mirror and decide. It is your choice and your prerogative. Just know wholeheartedly that you are beautiful just the way you are. Love and be loved. XOXO.